Turtle on a bed of wrapped caramels. Since I had some heavy cream burning a hole in my refrigerator AND some whole pecans, I got it in my head to make some turtles. Turns out it was half & half, not cream, burning a hole in my fridge, so I ended up having to go to the store for the cream because I'd already gotten myself going on the idea. 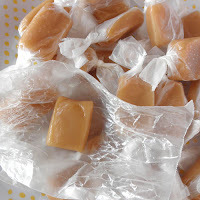 I found the caramel recipe at allrecipes.com, but of course I had to modify it a little since I didn't want to open a whole can of evaporated milk for the half cup it called for. I halved the recipe and that's what you'll see below. Even with just half of the caramel recipe, I was able to make 24 turtles and have 24 wrapped caramels. 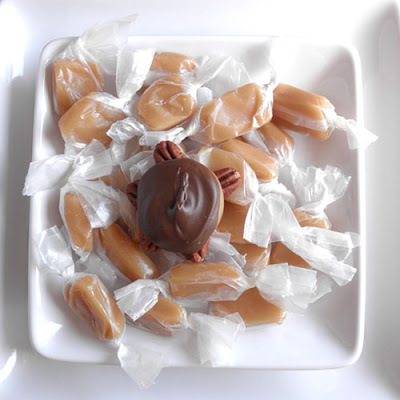 The turtle recipe below uses all of the caramel for turtles, so if you want some wrapped caramels too, simply adjust the amounts of nuts & chocolate. Line an 11x 7 inch pan with parchment paper. (I know this is an unusual size for a pan, so an 8 x 8 inch square pan would work too.) Place pan on top of a wire cooling rack. In a large heavy-bottomed pot over medium/medium-high heat, combine sugar, brown sugar, corn syrup, whipping cream, salt, and butter. Monitor the heat of the mixture with a candy thermometer while stirring. When the thermometer reaches 240 degrees F, remove the pot from the heat. Stir in vanilla. Transfer mixture to the prepared pan and let the mixture cool completely. For turtles: While caramel cools, on a parchment lined cookie sheet arrange pecans in fives, sort of in a radiating flower pattern. Once piece at a time, roll caramel chunk into a rough ball and flatten slightly. Place each on top of a group of pecans. 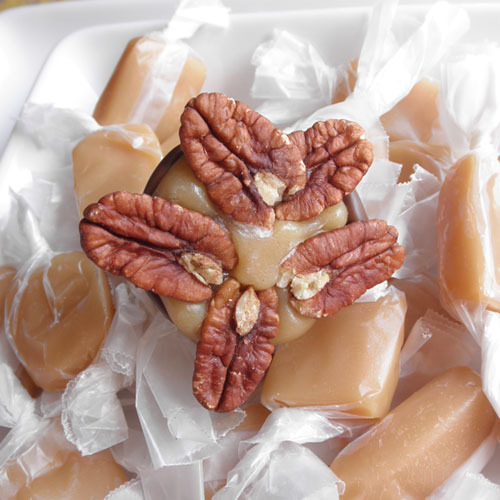 Caramel will soften and stick to pecans, so you don't have to press it. When they're all done, set aside, and then temper your chocolate. Scoop about one teaspoon of melted/tempered chocolate onto each turtle and use back of spoon to make sure all of the caramel is covered on each turtle. 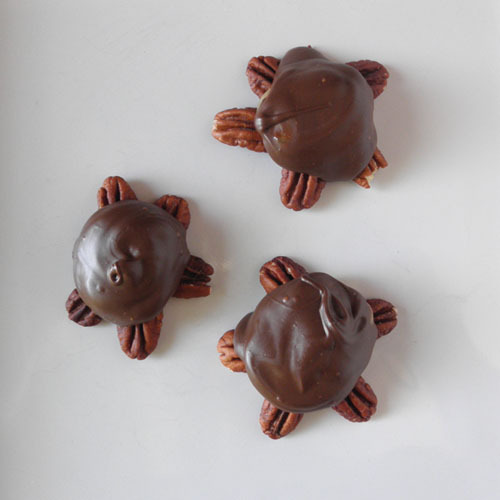 Place turtles in a cool, dry location for chocolate to set. Store in an airtight container or place in individual cello bags to give away. kelly, only you would make something i don't like look both cute and delicious. i'm sure these were a hit at eddie's school! Hi Kelly. These are sooo cute! I wouldn't be able to eat them!